Explore a land 400 million years in the making. The Arabia Mountain National Heritage Area (AMNHA) is an open landscape of breathtaking beauty, peace, and wonder just east of Atlanta along I-20. Dominated by two massive granite outcrops, it offers visitors natural wonders, compelling history and heart-pumping activity. The PATH Foundation trail within the AMNHA is designed to link cultural, scenic, natural and historic sites. Over 30 miles of trails are open to bikers including a connection to the Monastery of the Holy Spirit. The interactive PDF below can either be printed or viewed on a digital device. Links, when clicked, will lead to additional information. 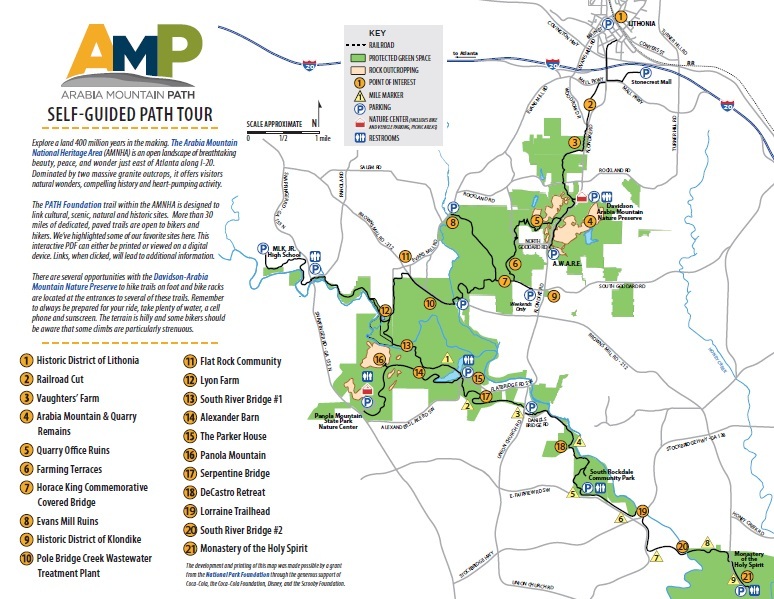 There are several opportunities with the Davidson-Arabia Mountain Nature Preserve and Panola Mountain State Park to hike trails on foot and bike racks are located at the entrances to several of these trails. Remember to always be prepared for your ride, take plenty of water and sunscreen. The terrain is hilly and bikers should be aware that some climbs are particularly strenuous.